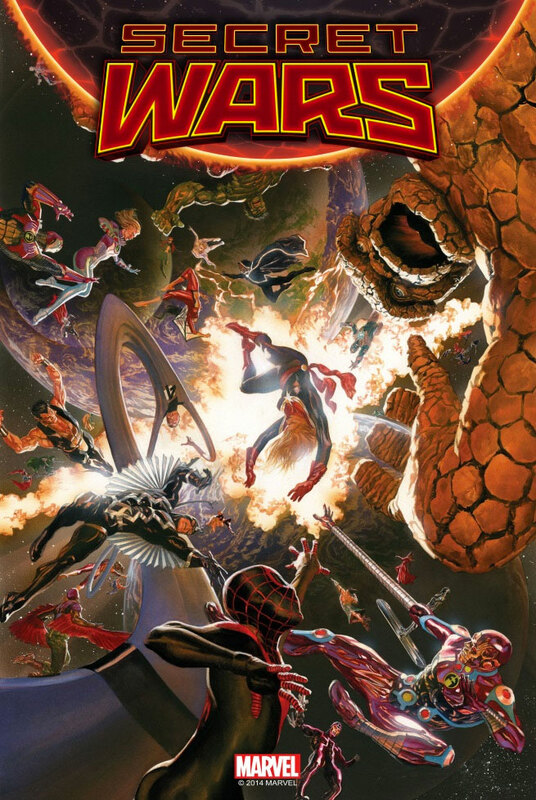 Alex Ross lends his talent in creating an albeit unique cover for Marvel’s upcoming big event Secret Wars #1. This will be hitting us like a colossal solar flare come 2015, and features respectable talents including writing from The Avengers‘ Jonathan Hickman and art from Thor: God Of Thunder‘s Esad Ribic. The dynamically-rendered cover shows classic Marvel characters (and a few newcomers) entwined in a vortex of angst and struggle, including Captain Marvel, The Thing, the Hulk and Spiderman (Miles Morales). The narrative arc for Secret Wars takes place after the events of the previous New Avengers‘ “Time Runs Out” storyline, where the barriers that kept parallel realities separate have been destroyed, resulting in the collision of these once-separate worlds. And with the Titans attacking, and Ultron almost upon us, it seems unrest in the Marvel Universe is unquenchable and without end.